I got the idea for this tile from fellow demo, Andrea Walford. She posted a similar tile made with the Angel stamp. She also posted how she used the shimmer paints mixed with re-inkers to paint it. Well, I knew when I saw that, that I had to do it! So, into my basement I went, to find the tiles, I knew I had! To make this tile, I wiped the tile with a cloth (a.k.a. my jeans) to get off any dust or residue. Next, I took out a paper plate to use as my paint palette. You DO NOT need a lot of paint to get good coverage. I worked with one drop of Frost White Shimmer Paint (item #116854) for each color that I needed. Then, I mixed in 1 drop of Re-inker to the paint. For the darker colors like Bravo Burgundy, i used 2 drops of Frost White to 1 drop of reinker. Otherwise, it would looked too dark. Then, I simply painted the areas on the tile carefully and used a very little bit of paint. Also, when I finished painting the picture, I used the Champagne Mist (item #116806) to paint around the outside of the picture. The classic reinker colors I used were: Blush Blossom, Barely Banana, Bashful Blue, Bravo Burgundy, Always Artichoke and Summer Sun. 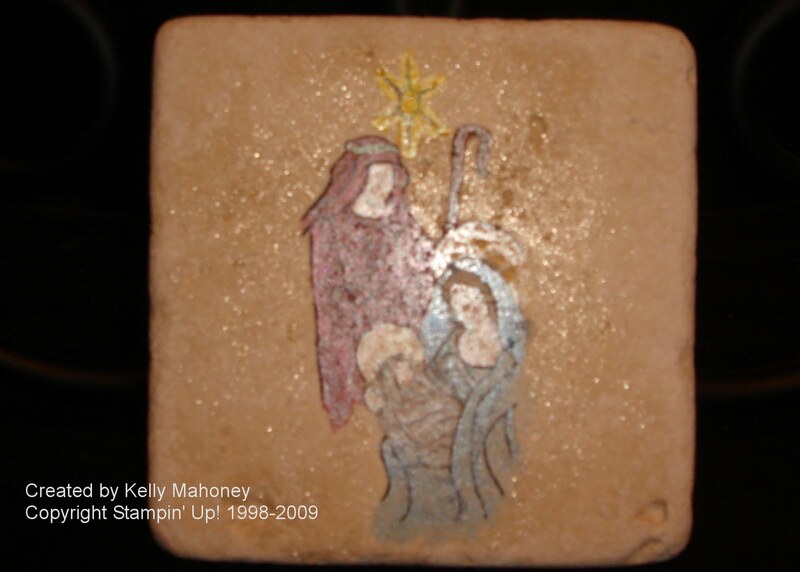 I also used a little of the Platinum Shimmer Paint (item #116807) mixed with Frost White and Bashful Blue for the Baby Jesus' wrap. If you paint something that you do not like, you can wipe it away with a little water. One part of mine came out a little too dark to start so, I just added some water to the brush and lifted some of the paint off. Make sure that you seal these coasters with some clear sealant spray that you can find at one of those big craft stores or a hardware store. You can finish the back by glueing on some felt to protect your table. I think a set of these coasters would make a great Christmas gift!! So I finally had the chance to participate in another color challenge! It felt so good to do this again! It was like seeing an old friend again after being away for awhile. I know corny... but ya know it is the little things in life right!!! The colors for this week were Blush Blossom, Ruby Red and Close to Cocoa. I find that I never use Blush Blossom unless it is in one of these color challenges and when I do, I actually like the way comes out! Who Knew?! For this card, I started with a Close to Cocoa card base. Next I added the Ruby Red Layer. For the top layer, I used Blush Blossom. I stamped this piece with the flower from Season of Joy (item #110384) in Blush Blossom ink, followed by Ruby Red, and then Close to Cocoa. I tied the White Satin Ribbon around it. Don't you love that Satin ribbon?? Next, I punched out the Five Petal Flowers - 1 from each color of Card Stock. I layered these together and added 3 silver brads in the center. The flower is attached with Dimensionals. Finally, I stamped "Merry Christmas" in Close to Cocoa on Ruby Red and cut it out. Then layered it on Close to Cocoa and cut it out again. I hope you like it! I am so glad to be back into doing these color challenges. Hopefully, I will be able to stick with it again! Also, I have a few more posts that I am setting up right now so check back again soon to see a great gift idea! This week's deal is a great one!!! To take advantage of this week's deal, order online or call me by October 19th at noon. To place your order online, click here! 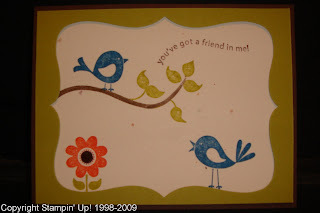 So did you hear about Stampin' Up! 's new Build a Bear stuff?? I really was not going to get any of this stuff! No, really... I wasn't. But then, I saw some of the cutest cards and such! I just could not resist! Then, I went to Fall Fest and let me tell you, I am so glad I had some of it already, because I came home with so many ideas! I will share some more of them with you soon, but first, here are a few of the first bears that I made! I used the Cottage Wall DSP and some Rich Razzleberry and Old Olive card stock. For the bears themselves, I used Creamy Caramel and Naturals Ivory card stock. I hope you like them. Aren't they just too cute!? Wait till tomorrow when my Halloween die arrives and I can make the pumpkin bear and the witch bear. If you are like me and just can't stand to be without these bears any longer, Click here to go to my website and order yours online! I know it has been awhile... but well, I finally updated my calendar and I am sooooo excited to share some great new projects with you! so you can check out my calendar here. I hope that you can join me for some classes really soon! Also, did you hear that Stampin' Up! has brought back the Deals of The Week for October? Well, they did! Now through October 12 at 9:50 AM(Mountain time), you can get the folowing punches for a great price!! To take advantage of this offer, simply e-mail me with your order or go right to my website and place your order online! Get My Digital Studio at 50% Off!! When you host a workshop totaling $250 or more you can choose any one item* from the 2009 Holiday Mini Catalog for only $10! *Offer excludes hostess sets and My Digital Studio. Host a workshop of at least $400 and get My Digital Studio for 50 percent off the retail price (retail price: $79.95; promotional price: $39.97) when you use your free hostess dollars! So why don't you give me a call and book your workshop, so that you can take advantage of this amazing deal! Call me!!! 201-703-7128! So this week's color challenge was to use Old Olive, Really Rust, Sahara Sand and Bashful Blue! I decided to get fancy and use My Digital Studio this week to make my color challenge! 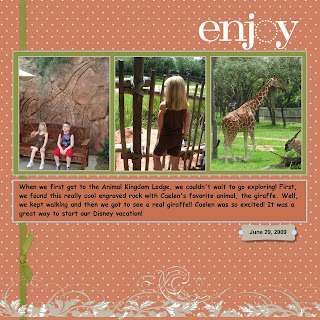 Now, this page I created from scratch, so like any scrapbook page, it took me awhile. I had to decide so many things and I just kept playing. The difference with the digital stuff is that I didn't have to throw a whole bunch of stuff away! Yay! Anyway, here is the final product. My First My Digital Studio Pages!!! Ok.... SO I am so excited!!!! I recieved my My Digital Studio today!!!! I even had a little time to play! First, the downloading onto my computer was super easy! Then, the interface is also so easy to use! I made all of these pages in under 1 hour and I just loaded it this afternoon! Now, I was not picky and I just used one of the templates provided! I hardly added anything or rearranged or played too much... I just wanted to play a little bit and get some pages made. So here they are depicting my kids first day of school today! This awesome program will be available for you to purchase on October 1st. By then I will be a certified instructor, (I hope), and will be able to help you get started making your own amazing albums. By becoming a certified instructor, you know that I will be able to answer all of your questions and help you by knowing all of the ins and outs of this great software! I can't wait to share this with all of you! I am currently booking workshop dates for September and October, so call me to get your own personal demonstration of this new thing! 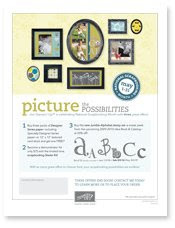 If you would like to place a Stampin' Up! order, click here! Enjoy!!! Please let me know what you think of my pages!!! This is best selling new stamp set right now! I love it! It is such a versatile stamp and so easy to use! Here, I just stamped it on Crushed Curry card stock in Soft Suede ink. I added the grommet and brad in the center. 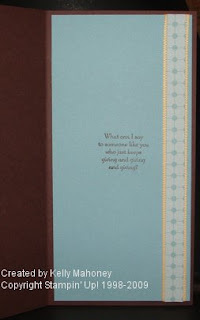 Finally, I stamped the sentiment in the bottom corner, also in Soft Suede ink, and then layered it on a Soft Suede card. Quick and Easy! Holiday Mini Catalog is Here!!! Oh WOW! What a great time of year... The kids are going back to school and the new Holiday Mini catalog items are now available for purchase! This catalog is packed with great new products! There are so many wonderful items for creating Halloween and Christmas projects as well as things for year round fun! There are even new Build a Bear stamps, accessories, and Sizzix dies!!! They are way too cute! Simply click on the image above and get shopping!!! As a special for the month of September, anyone who orders the Sweet Centers stamp set, will receive a set of the sweet treats cups for FREE! 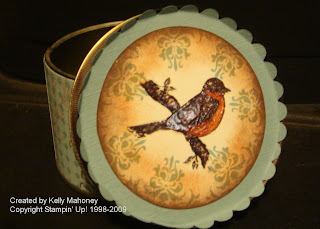 This special is only available through me, Kelly Mahoney, your Stampin' Up! demonstrator! You must e-mail or call me with your order by September 30th to get your free cups! 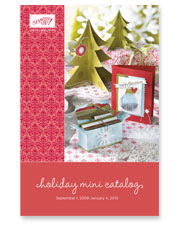 In just a couple of days, the new Holiday Mini catalog will be available. One of the new things you will find there is the stamp set called Sweet Centers and the Sweet Treats cups! These are great! I also think they are a great price!!! The Cups are just $2.95 for 12 that is less than $.25 a piece! Here is the first card I made with them! This was cute and easy to make! I hope you like it! I will be sharing a few more samples and sneak peeks from the mini in the next few days. Anyway, I am trying to get back in the swing of things and start posting regularly and get some classes planned and all of that good stuff. To get started with that, I participated in this week's color challenge. The colors were chocolate chip and any two of the new in colors. I went with Bermuda Bay and Melon Mambo. I started with a Choclate Chip card. I stamped the Upsy Daisy flowers across the bottom of it in Chocolate Chip ink. Next, I scallop punched a scrap of Bermuda Bay and attached it to a piece of Melon Mambo. I ran that through the Big Shot and cut it out with the Top Note Die. I stamped the Upsy Daisy image again on the Mambo cs with Mambo ink. I added the "Birthday Celebrations" with Chocolate Chip ink. I wanted the Top Note piece to "pop" a little more, so, I cut out another top note from Whisper White cs and cut off the ends. I layered those on the edges as shown. Finally, I added the 5/8" Chocolate Chip ribbon. I also wanted the inside to be special. Since it is a dark colored card stock for the card, I like to add a piece of White cs to make it easier to write in. This time, I cut out another top note from White cs and stamped the tops of the Upsy Daisies in Melon Mambo ink and stuck that inside.! Razzle Dazzle in Rich Razzleberry! OH WOW!!! I love this new In Color!! As you know, I really like purples - just about any shade will do! Well, this one is gorgeous! This is another of the new colors. It is called Rich Razzleberry! The stamp set is Razzle Dazzle and the new dsp I used for this card is Razzleberry Lemonade! Oh my word I love that Stampin' Up! Makes so many things that coordinate so well with each other!!!!!!!!! It makes my job so much easier and makes creating so much more fun! This card I made for a swap that I am in using things that we could pre-order as sneak peeks from the new catalog. I stamped the main image in white craft ink and embossed it with white embossing powder. Next, I added the dsp on the bottom. The Old Olive strip on the side is stamped with some more images from this set also in Old Olive ink. The ribbon is the new in color polka dot grosgrain ribbon. And finally, the flower is from the Flower Fusion set and I dressed it up with a Jumbo silver brad! 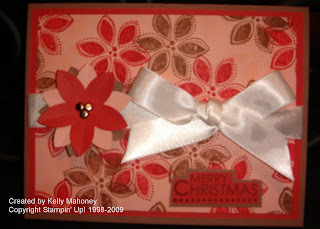 One more note, the sketch that I used to create this card came from the Stampin' Success magazine that I get as a demo. It has so many great ideas and sketches that really help me with my business!! Did I tell you that I love the new in colors!! By the way, we also will have markers for the in colors this year! YAY!!! Brayered Roses with new In Colors! Here is another card using Patty Bennet's Brayered Roses technique! This time I used both Crushed Curry and Melon Mambo on the roses. The card base is Crushed Curry. The "Best Wishes" comes from the Oval All set. The scallop oval is punched from Melon Mambo cs. A nice simple card - one of my favorite kinds! Some great pics of Caelen! I have a few color challenges to share with you today! This first one is from the week of May 19th. The colors were Tangerine Tango, Old Olive, So Saffron, and More Mustard. I started with a card base of Tangerine Tango. My main panel was Very Vanilla. I started by Brayering the whole sheet with so Saffron. Then, I brayered from the top down, not totally covering the Saffron, with More Mustard and finally with Tangerine Tango. From the bottom, I brayered a bit of Old Olive. Next, I stamped the flowers and sentiment in Chocolate Chip ink. I finished it with a large grommet and 5/8" chocolate chip grosgrain. This card is from the week of May 26th. The colors were Almost Amethyst, Basic Gray, So Saffron, and Garden Green. I used one of the new sets that I earned for FREE from Sale a Bration. (One of those extra perks of being a demo!!) This is the "Friends 24-7" set. I stamped the Almost Amethyst panel with the long flowers in Almost Amethyst craft ink (it is a little hard to see in the photo!) and layered it with Garden Green. I stamped the brocade image in White craft ink and embossed it with white embossing powder on a basic gray panel. This was also layered on Garden Green. The "here for you" was stamped on So Saffron inside the frame from the "Great Friend" set, (which is in the current mini catalog and you might see it after that too...). All pieces were layered on a Basic Gray card and then I added some rhinestone brads. Ok... up next is the challenge from June 2. These colors were Tempting Turquoise, Green Galore, Apricot Appeal and Gable Green. Last but not least, is the challenge from this week! The colors were Barely Banana, Garden Green and Bordering Blue. Since we have some new In-Colors, we could swap out the Banana for the new Crushed Curry!! So that is what I did! Next, I cut out around the flowers. 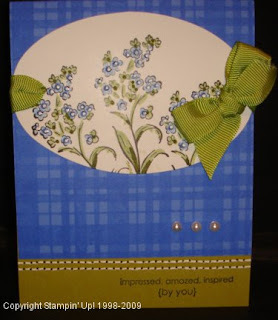 I stamped the grass from the "Inspired by Nature" set and the sentiment in Garden green on my Bordering Blue card. Attached the flowers and that is it!!!! So now I am all caught up! Phew!!!! Stay tuned in the next few days for a few more sneak peeks!!! More new in colors and stamp sets!! The Last Chance lists are out now for this year! These are the products that will no longer be available after June 30th. Some of the items, like those on the Retiring Accessories List are only available while supplies last. So get your orders in early!! You can order online directly through my Stampin' Up! website or by calling or e-mailing me with your order! There are some other great promotions going on including the fact that some of the accessories are on sale for as much as 50% off and that you can get extra hostess dollars when you host a show this month! Check those out here! The latest Creative Challenge for my group was an inspiration challenge. The picture that was to be our inspiration was this picture of dishes from Walmart. As soon as I saw these dishes, I thought, Priceless, the stamp set that is! I also saw the colors Night of Navy and a little So Saffron along with Whisper White! Did you ever have one of those moments when you get a picture in your head of a card? You have this vision and then when you put it on paper it doesn't quite look as good as it did in your head.... I kinda feel that way with this card. layered this with Night of Navy card stock and then with So Saffron. For the Sentiment, I stamped the So Kind in Night of Navy ink and punched it out with the large oval. I punched out a scallop oval from So Saffron and an extra large oval from Night of Navy. 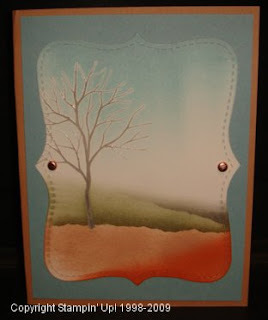 I layered the ovals together and added them to the card. That is it. A nice, simple, quick card!! This week's colors were Really Rust, Baja Breeze and Chocolate Chip. These colors go really well together! I have had this tin sitting on my desk ready to be altered for a long time now! I guess I have been looking for the right inspiration to decorate it. The tin held Mulling spices from Williams-Sonoma. I simply cleaned it out and let it dry thoroughly. I took a piece of Designer Series paper from the Urban Garden pack and stamped it with stampes from Friends 24-7 set in Chocolate Chip and Really Rust ink. Then I used sticky strip to adhere it to the outside of the tin. 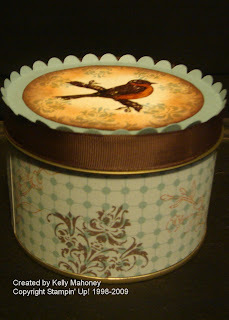 For the top, I covered the outside rim with the 5/8" chocolate chip grosgrain ribbon. Next, I used my Big shot to cut out the scallop circle from Baja Breeze textured cs. Next, I cut out a 3.5" diameter circle from Very Vanilla cs using the Circle Scissors plus. 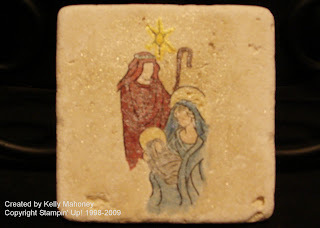 The Vanilla piece was stamped with the bird image in Chocolate Chip ink. I used my markers to color it. Next, I colored over the whole thing with my Versamarker and embossed it with clear EP. 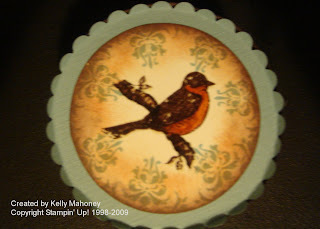 Then, I stamped the damask image in Baja Breeze around the outside and sponged with both Really Rust and Chocolate Chip. I adhered these layers to the top and folded up the scallops on the top. I really enjoying covering tins like this! It goes with that whole reduce reuse recycle thing! And, they even look nice too! Last week's color challenge colors were Chocolate Chip, Baja Breeze, Very Vanilla and Certainly Celery. I wanted to try the latest craze in watercoloring techniques. You can see a great tutorial by Patty Bennett here. It came out ok... I think I need some practice to get it just right. Also, I think the colors got a little washed out in the picture. Anyway, I chested a little on the colors and used Shimmery white instead of Very vanilla. The Very Vanilla does not hold up well to a lot of water like the Shimmery White does. 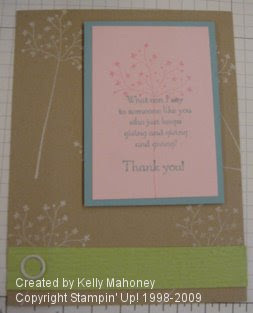 The card base is Baja Breeze and the sentiment is a rub on from the Chit Chat set. The stamps I used were Fifth Ave Florals - my favorite! I hope you all had a wonderful Mother's day! Mine was good and not too stressful - Yay!! Anyway, I am trying to get back into a regular routine and get back to my classes! So below is a picture of the cards we will be making at my next class! This class will be $10 for all 4 cards! Plus, each of these cards has a different technique - so extra bonus! The class will be held on Wednesday, May 20th at 7pm and again on Friday, May 22nd at 10am! Please let me know if you would like to come by Monday May 18th. Also, if you can't make it, I will be offering a class kit by mail with instructions and pictures of each card. The images can even be pre-stamped for you iof you would like. I am really excited to share these cards with you! So, come join me!!! Check back tomorrow for the latest color challenge! Well, I am just about caught up now. This color challenge was to use Chocolate Chip, Tangerine Tango and Kiwi Kiss. I like all of these colors and I even like them toghether... but I am not sure I like them for this card. 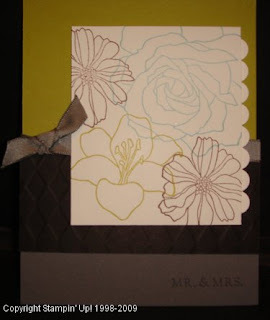 I embossed the Tangerine Tango card stock with the Manhattan flowers enbossing folder. Next, I wrapped that piece of CS with the Kiwi Kiss and Very Vanilla satin ribbon (have I told you that I love this ribbon and hole we get it in more colors next year??). Finally I attached this to the Chocolate chip card and added the Scallop oval stamped with a sentiment from the Oval All stamp set! Ok... so here is the challenge from April 24th. The colors were Riding Hood Red, Always Artichoke and Basic Grey. I used my brayer for this card. Have you heard of Michelle Zindorf and her brayer technique?? She is like a superstar on Splitcoaststampers. She makes amazing cards! Recently she signed up to be a Stampin' Up! demo and is actually one of my sidelines!! I even get to meet her in September at our upcoming Fall Fest! Anyway, all of that was to tell you that her work is what inspired this card!!! I stamped the flowers from Upsy Daisy in Basic Gray. Next, I brayered the top with Riding Hood Red and the bottom with Always Artichoke. Next I sponged around the entire panel with Basic Gray ink. I added some highlights to the flowers with my white gel pen. I hope you are all enjoying your Sunday! Here is the card I made for the color challenge from April 14th. The colors were Baha Breeze, Pink Pirouette, Certainly Celery and Kraft. I made 2 versions of this card. One with the brads on the bottom the other with the new small grommets from the Occassions mini! I used the ones with the grommets for my swap at Spring Fling. Spring Fling is a demonstrator event run by my upline. This is one of the places that we get training and ideas for our business! Did you see my post yesterday about being able to sign up to be a demo for only $75?? Now is a great time to be a demonstrator! Call me for more info!! Oh wow!!! There are some great promotions going on this month at Stampin' Up! for National Scrapbooking month! 1. Buy 3, get 1 Free!! - That's right when you buy 3 packs of Designer Series Paper or Textured Card Stock, you get to choose one more for FREE! You can mix and match for any combination of DSP and Textured CS! 2. There is a new alphabet set called the Jumble Alphabet that will be released in the new catalog in July. Well, you can get it now for 20% off the regular price!! This alphabet includes both upper and lower case letters and is double mounted. 3. Best of all, you can be a demonstrator for just $75!!!! Can you believe it? That is the best price for a Starter Kit that I have ever seen! For More info on any of these great promotions, just click here! Also, you can always give me a call or send me an e-mail for more info too! Catching up on Color Challenges! OK... so I have actually been doing the color challenges on time each week... but I have not had a chance to post them. So over the next few days, I will post my color challenges from the last 3 or so weeks. This was from April 7th. The colors were Certainly Celery, Sage Shadow, Pretty in Pink, and So Saffron. My inspiration for this project was based on another challenge I saw on Splitcoaststampers.com. That challenge was to make this envelope scrapbook. There is a tutorial here! This was a lot of fun to make and I can't wait to put some photos in it. On April 1st, Stampin' Up! released the new pop-up dies for the Sizzix Big Shot. Best part is they are not available anywhere else yet! Anyway, there is a birthday cake pop up and a ball pop up. Both dies come with great instructions and make amazing cards, scrap pages or decorations. Here is a card that I made with the Birthday cake pop up. I made for a birthday party my daughter was attending. The stamps and this paper happen to be retired, but the idea certainly isn't.... The cake was just colored with Stampin' Write markers. I punched the top and bottom of the panel with the Eyelet border punch. 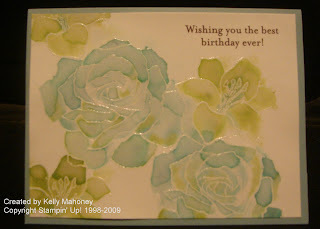 The background of the card was stamped tone on tone with the little flower stamp. Finally, I layered the Happy Birthday on a scallop circle and popped it up with a Dimensional. When you open the card, this beautiful cake pops up to greet you. I decorated the layers with some of the flowers from the 3 flower punch. The candles on the top are from the die. Finally, for the bottom of the card, I added another eyelet border. I will share another of these cards with you tomorrow. It is the card I made for my friends baby shower. Ok.... so I am posting this late as usual! My sister, Shine, has been on my case for days. She has been telling me, "People want to see new things on your blog, not just the same picture for weeks. Now, go update your blog so I can see some of your new projects...."
So here is my project for today! It was the color challenge for last week. The colors are Chocolate Chip, Baja Breeze, Pumpkin Pie and So Saffron. I have been wanting to make a card with my new set from the Occassions mini called Very Versatile. I also needed some more inspiration and used Beate's Weekend Sketch. This card is 4x8". The Designer Series paper on the side is from the Urban Garden pack. The Corduroy buttons can be found in the new Mini. The Ribbon is the free ribbon that I got during Sale-a-bration. I also took some time to decorate the inside of the card. 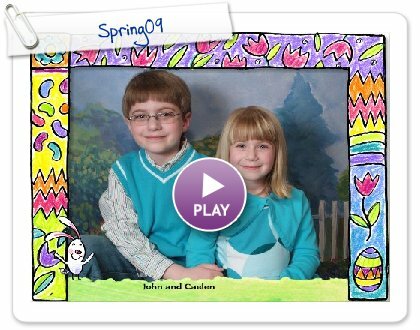 Some Spring pics of the kids! 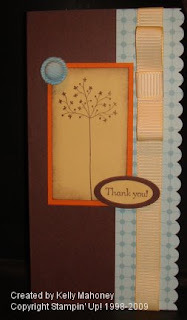 This card above was made by Tracy Bakunas. 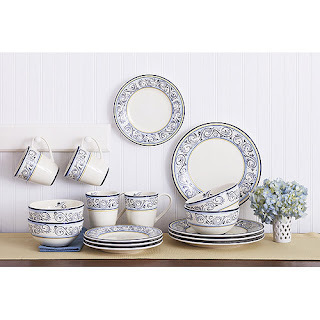 I love this set - Fifth Avenue Florals... It is definitely my favorite! This beauty comes from the very talented Karen Barber! ... and finally this one was made by Brenda Rosenau. I love those little birds! I also really like the way she used the negative space from the Top Note die. I hope you have enjoying seeing these amazing works of art by some very talented ladies! I am a stay at home mom and Stampin' Up! Demonstrator. I have been a demo since 2002 and love every minute of it! I would love to have you join my Stampin' Up! team, contact me for some more information! I love sharing my work with you, I hope you enjoy it as well. Please use any of these ideas for your own inspiration. Click here to see my classes!